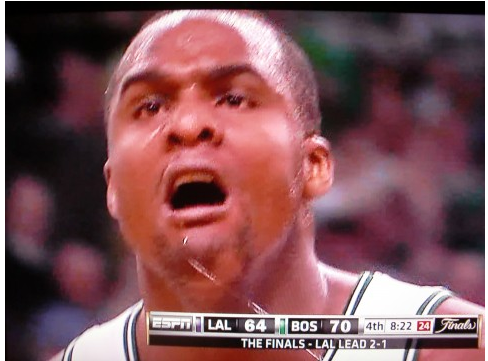 Big Baby Davis Keys Celtics Win…Remember this from 2008? Yes, the Celtics tied the 2010 NBA Finals at 2-2 thanks to the effort from Shrek and Donkey i.e. Glen “The Ticket Stub” Davis and Nate Robinson. While last night’s performance was beastly I think we all need to remember the joy Davis brought us in 2008 in the locker room after winning the title (thanks to myfoxboston.com for this and click here). Posted by Why Did I go to Law School? 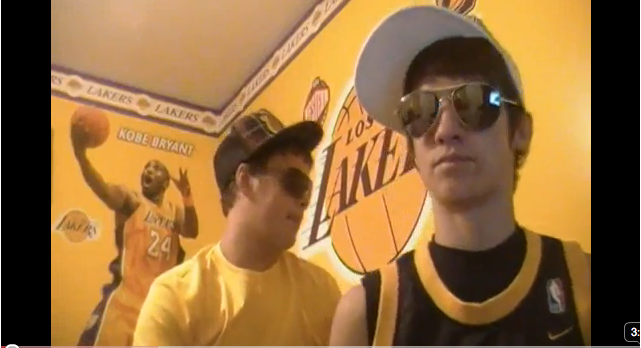 Lakers Home to Worst Fans in NBA? Check out this disgraceful rap video and see if you can last longer than a minute. Thanks to Brian Gleason for passing it along. I think this series comes down to the health of Rajon Rondo. Derek Fisher and the Lakers have struggled all season (and post-season) defending the point guard position. First it was Russel Westbrook, then Deron Williams and most recently Steve Nash and Goran Dragic. Orlando seemed to figure out how to neutralize Rondo by forcing the Celtics into a half court set filled with Paul Pierce isolations, but barring Rondo’s hip and back seriously being injured I think Rondo is primed to win this series by himself. Against Oklahoma Kobe decided to guard Westbrook, but think about Kobe doing that vs the C’s…that would leave Ray Allen running circles around Fisher. Remember how badly Allen torched Sasha Vujacic in ’08? Lakers fans and the “experts” keep pointing to the improvement and new-found toughness in Pau Gasol’s game as what could be the deciding factor for the Lakers this time around. I don’t see that happening though, mainly because of Andrew Bynum’s poor play since injuring his knee. During the regular season Bynum allowed Gasol to showcase his skill set, but that won’t happen vs a physical Celtics front line. That means Gasol is going to have to play more at the center position alongside Lamar Odom at power forward (who will be worried about how the Boston fans are treating Khloe Kardashian)…In that situation I would take Kendrick Perkins, Kevin Garnett and Big Baby’s toughness and physical play in a 7-game series. While the Boston Celtics have flat-out dominated the Magic in the Eastern Conference Finals they were caught off guard last night when the Magic decided to show up. Sitting in the stands I got to listen to a man say, “he’s pretty good” while watching Jameer Nelson put up 23 points including two clutch 3’s in overtime (no, he didn’t call glass). I guess it was easy for everyone to forget that the defending Eastern Conference champs posted 59 wins this season and take the series for granted with a 3-0 lead. The Magic had a great gameplan although I’m sure three points from Vince Carter was not part of it. The Celtics struggled to push the tempo and the Magic did a great job defensively in transition. This forced the C’s into a lot of isolation sets and limited the ball movement that is such a huge part of the offense. On top of that the Magic effectively set high screens for Nelson confusing Rondo and creating mismatches for Dwight Howard who finally lived up to his image. Howard controlled the glass on both ends and made you forget his eight missed FT’s. It will be impressive for the C’s to end the series in Orlando, but I think the Magic force a Game 6 back in Boston. With that said the C’s have never gone to six games or more when holding a 3-0 series lead. I know I know…it’s been oh so long since any of us last posted something on here. I apologize to our loyal readers. Anyways, I thought it was time for the world to hear my father’s latest Celtics poem, which should get you fired up as the C’s return to the Garden up 2-0 looking to close out the series. Also, none of this poem has been altered including the all caps and green coloring. Always fun watching people learn how to use a computer (earlier this week he watched his first TV show online)! The Boston Celtics are off to a 5-0 start looking to surpass last season’s 27-2 record, but more importantly finish the way they finished in 2008…with another title. The Boston Globe is already starting the 72-10 talk, and if healthy it might be hard to argue. On the first night of a road back-to-back to the Celtics faced one of the hottest offenses in the NBA and absolutely shut down the Sixers. Even the greatest 3-point shooter in the history of the NBA (statistically at least…just ahead of Steve Kerr and Hubert Davis), Jason Kapono, couldn’t help the Sixers shoot above 40% or break 80 points. Point guard Rajon Rondo took his new contract and closed out the first quarter by putting the C’s up 19-17 with this sick out-of-bounds shot. The reserves came in and that was the end of that game. The Celtics were able to rest their big men Kevin Garnett and Kendrick Perkins, which should bode well tonight in Minnesota going up against former Celtic Al Jefferson. Rasheed Wallace continued to shoot nothing but 3’s draining 6-8 and finishing with 20 points in his hometown. Marquis Daniels continues to play smart basketball and penetrate while Shelden Williams has to be the biggest surprise of the young season. The former lottery and husband of Candace Parker is showing flashes as to why he was given the nickname the Landlord. The three things Celtics fans have to really enjoy outside of the wins, which of course are most important, are how the Celtics lock down defensively, move the ball on offense and are so deep that Doc can limit the starters minutes and hopefully keep them as fresh as possible as the season goes on. The Celtics racked up 27 assists on 41 fg’s last night and limited yet another team to under 40% shooting for the 4th time in 5 games.